Portland Cello Project gives a new sound to familiar hits. Douglas Jenkins finds fans of classical music in the oddest places. Once, he took the stage with the Portland Cello Project after midnight in a bar in Fargo, N.D., and jumped into Manuel de Falla's high-energy "Ritual Fire Dance," which includes a section that calls for the cellists to hit their strings with the wooden backside of their bows. To everyone's surprise, that prompted a woman in the audience to shout, "Woohoo! Col legno!" "It was one of the most surreal experiences of playing with this group, to have a really drunk person who knew the Italian term for the bowing technique we were using, and also thought it would be funny to scream it while she was dancing in the front row," Jenkins says. "We talked to her after the show, and of course she turned out to be a violinist." Jenkins is the ensemble's musical director and one of nine performing cellists. He says one of the group's guiding principles is to take the cello to strange new places: bars, nightclubs, dance parties, or really wherever strikes their fancy. The ensemble originally got together for a one-off show at Portland's Douglas Fir Lounge in 2006, but slowly evolved into a touring group featuring a rotating cast of cellists and classically trained woodwind, brass and percussion accompanists. Over the years, they've built a repertoire of more than 1,000 songs, including pop hits such as Taylor Swift's "Shake it Off." For listeners who tend to write off radio hits, hearing a classical interpretation of a song like "Shake it Off" can be enlightening. Lifting the melody from the overproduced, homogeneous-sounding track and recontextualizing it with classical instrumentation brings out the beauty of the music, Jenkins says: "You get to that point where you're overlooking something that, at its basis, is a great song. It's written really well and it's unique; it's popular for a reason." Speaking ahead of the Portland Cello Project's Thursday, May 10, show at The State Room featuring world-class improvisational cellist Skip VonKuske, Jenkins says he booked Salt Lake City as the tour kick-off because of the warm reception the ensemble has received here in the past. "Maybe it's the venue, or maybe it's the city, but it's always a party," he says. The versatility of the cello allows the group to cover sounds as high of those as a violin and as low as an electric bass guitar. "What drew me to the cello is the range," he says. "It's the same as a human singing voice, from the low to the high. I can't sing, so I need something else to make those sounds for me. It's a human sound—and I think that's what makes it so universally accepted—but it also has more textures than a human voice can create." Transforming rock and pop songs into classical arrangements can be challenging. He's found that many radio hits rely almost entirely on sonic textures rather than a harmonic progression. And he's had some misfires, songs that just didn't work, like 50 Cent's "In Da Club." "Sometimes, the entire work is built around just one weird sound," Jenkins says. "And from a technical standpoint, certain intervals are tricky for us to make work. Like, guitars are tuned to fourths and cellos are tuned to fifths, so some guitar melodies and riffs—I always think of "Sweet Child o' Mine" by Guns N' Roses—are extremely difficult to pull off on the cello. I'm not saying it can't be done, but you have to find ways to work around that." One of Portland Cello Project's most-viewed videos on YouTube is a haunting rendition of Radiohead's "Karma Police." For years, Jenkins had purposefully avoided Radiohead because he didn't know how to approach songs which are, in his opinion, perfectly arranged to begin with. "It was a little intimidating to pull them out of that context," he says. "There's such a big responsibility when you tackle something that's so well composed. But after five years, we tried it, and it became something we really meditated on, and it's evolved with us. I rewrite the arrangements based on what the players are doing around me and when they think up new parts." 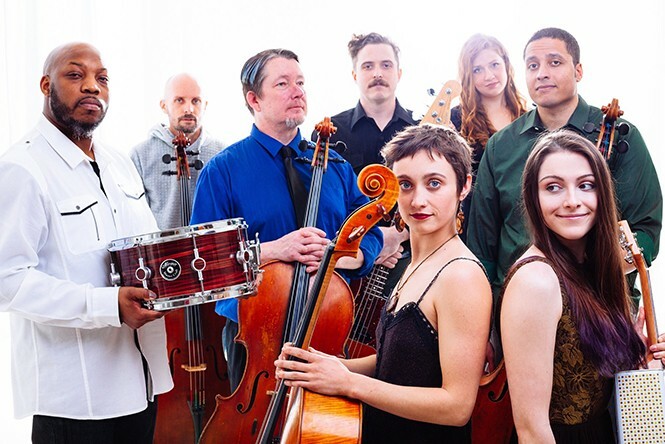 Jenkins acknowledges that Portland Cello Project has a quirky shtick, but that doesn't prevent the group from delivering artistically substantial performances. "Having a mass of cellos on stage is a gimmick in itself," he says. "But my philosophy from the beginning has been to make sure everything is quality. We wouldn't still exist if we were just a gimmicky group that made funny pop music covers. We're trying to make it a true experience for every show. We put so much energy into it."